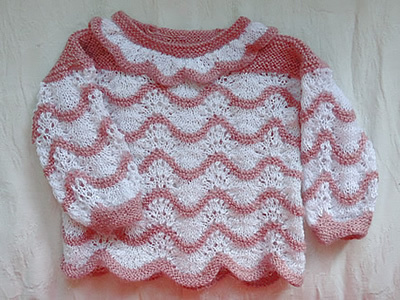 A really pretty top using the ubiquitous but nonetheless charming old shale (or old shell) stitch. 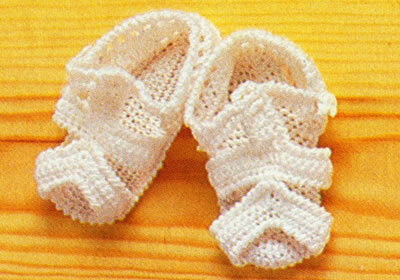 Originally it was knitted in fine white cotton bands interspersed with a fine slightly fluffy yarn, giving it a summery feel. However - how charming it would be in red and white for a small person's party outfit at Christmas. I am not sure how I would arrange the colours for a winter version - I favour the dominant red colour for the plain garter stitch - but it might be interesting to have the white as the fluffy bands simulating fur trimming. The pattern is for an entire outfit with pants, and some cute little cotton sandals (of dubious value...!). 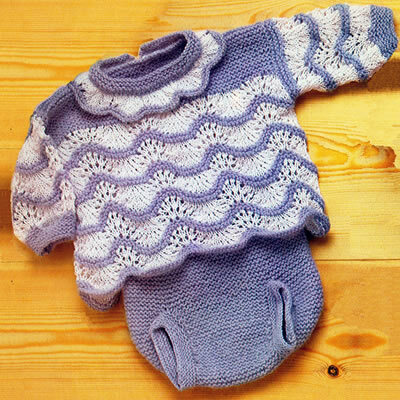 The angel top is worked in a combination garter stitch (every row knitted) and a Wave pattern using "old shale" (or shell) stitch. When working the Wave pattern, carry the yarn not in use loosely up the side of the work. This section is worked in one piece up to the armhole. Using 3mm needles and pink yarn (A) , cast on 192 sts and knit one row. 1st row (right side) : Knit. 5th row: Sl 1; * (k2tog) 3 times; (k1, yfwd) 6 times; k1; (k2tog) 3 times; repeat from * to last stitch; k1. 9th - 14th rows: Repeat rows 5-8 once, then rows 5 and 6 again. Repeat the pattern 3 (4) times more, then work the 1st to 3rd rows again. Next row (wrong side): K57, increase in the next 2 sts, k74, increase in the next st, and leave these 137 sts on a stitch holder; increase in the next st, knit to end. Continue on these remaining 59 sts to make the Left Back. Work rows 5-14, break yarn B and continue in yarn A only. Continue in garter stitch with yarn A until work measures 24 (27½) cm, or 9½ (10¾) inches, ending with a right side row. Cast off, placing a marker for the collar on the 26th stitch from the end. With right side facing, rejoin white yarn B to sts on stitch holder and pattern 78 (as 5th row of Wave pattern); turn and leave remaining sts on stitch holder. Continue in pattern on these 78 sts for Front and work rows 6-14. Break yarn B and continue in yarn A only. Continue in garter stitch with yarn A until work measures 20 (23½) cm, or 7¾ (9¼) inches, ending with a right side row. Next row (wrong side): K27 and leave on a stitch holder; cast off 6 sts; knit to end. 2nd row (wrong side): cast off 3 sts, knit to end. 4th row: cast off 2 sts, knit to end. 6th row: cast off 1 st, knit to end. 8th row: cast off 1 st, knit to end. 10th row: cast off 1 st, knit to end. Work a few rows on remaining 19 sts until Front matches Left Back to shoulder. With right side facing, rejoin yarn A to 27 sts of front left on stitch holder and k27. Finish to correspond with first side, reversing shaping. With right side facing, rejoin white to 59 sts on stitch holder and pattern 59 (as 5th row of Wave pattern). Finish Right Back to correspond with Left Back, reversing placing of marker for Collar. With 2½mm needles and yarn A, cast on 30 sts and work 10 rows in garter stitch. Change to 3mm needles, join in white yarn B and beginning with 5th row of the Wave pattern, work in pattern until sleeve measures approximately 11 (14½) cm, or 4¼ (5¾) inches, ending with a 14th pattern row. Break off yarn B and continue in yarn A only. Work 4 rows garter stitch. Work 2 rows stocking stitch using waste yarn in a contrast colour and leave stitches on a stitch holder. With 3mm needles and yarn A, cast on 120 sts and work 3 rows in garter stitch. Break yarn A, and join in yarn B. 1st row: Sl 1 , * k1, yfwd, k4, k2tog, sl 1, k1, psso, K4, yfwd; repeat from * to last 2 sts, k2. Rep these 2 rows twice more. With 3mm needles and yarn A, cast on 60 sts and work 6 rows in garter stitch. Work 2 rows stocking stitch using waste yarn in a contrast colour and leave stitches on a spare needle. Join sleeves to main part, unpicking contrast yarn and working stitch by stitch in back stitch on right side. Sew Collar into neck opening, starting and ending at back markers. Sew Neck Border over Collar, joining to Main Part in same way as the sleeves. Make 2 buttonhole loops at Left Back and sew buttons on Right Back to correspond. Pairs of 2½mm (UK 12) and 3mm (UK 11) needles. 24sts x 50 rows to 4 ins in over garter stitch (every row knit). Yarn A: 25sts x 38 rows and yarn B: 30sts x 40 rows to 4 inches (in stocking stitch on 2½mm needles). 0-3 (3-6) months, with second size shown in brackets. If only one set of instructions is shown then it is the same for both sizes. yfwd: yarn forward. Makes an extra stitch which forms a small pattern hole when knitted on the next row. k2tog: knit 2 sts together. sl 1, k1, psso: slip 1, knit 1, pass the slipped stitch over; also known as "ssk" (slip, slip, knit). m1: make a stitch by picking up loop lying before next stitch and work into back of it. Yarn B was their 100% cotton "Perlé 5" yarn with a yardage of 219 yards (200 meters). I used a substitute Twilleys thread for this. The pants are worked entirely in garter stitch (every row knitted) in one piece, starting at the front waist, working down to the crotch, and then up the back, ending at the back waist. Begin at front and with 2½mm needles cast on 48(56) sts and work 2cms, or ¾ inch, in k1/p1 rib. Change to 3mm needles and work 8(10) cms 3¼(3¾) inches in garter stitch, noting that 1st row you knitted is the right side, and ending with a wrong side row. Next row: Knit 13(17) and leave on a stitch holder; k22, turn, and leave remaining 13 (17) sts on a stitch holder. Continue on these centre 22 sts and work 9(10) cms 3½(3¾) inches in garter stitch,ending with a right side row. Break yarn and leave 22 sts on a stitch holder. With wrong side facing, rejoin yarn to sts on first stitch holder and knit to end. Continue on these 13(17) sts for left side of pants and work 4(5) cms, 1½(2) inches, in garter stitch ending with a wrong side row. ** Begin shaping side by decreasing 1 st at the beginning of the next and following 6th(4th) row. Break yarn and leave these sts on a stitch holder. Work 4(5) cms, 1½(2) inches, in garter stitch ending with a right side row. 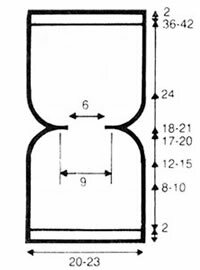 Working right side of pants as left side from ** until 6(8) sts remain, ending at side edge. Next 2 rows: Cast off 2 sts, knit to end. Next 2 rows: Cast Off 3(4) sts, knit to end. Work 2 rows on remaining 16 sts. Next 2 rows: Cast on 4 sts, knit to end. Next 2 rows: Cast on 3 sts, knit to end. Next 6 rows: Cast on 2 sts, knit to end. Next 6 (8) rows: Cast on 1 st, knit to end. Continue straight until Back matches Front to start of rib. Change to 2½mm needles and work 2cms, or ¾ inch, in k1/p1 rib. Leg Borders: With right side facing and using set of 4 needles, knit up 46(51) sts round each leg opening and work in rounds. Set of 4, 2½mm (UK 12) needles with points at both ends. 25sts x 38 rows to 4 inches in stocking stitch on 2½mm needles. With 2mm hook make 20 chain foundation row. 1st round: 1 dc in 2nd ch from hook, 1 dc in each of next 17ch, 3 dc in next ch, then back along other side of foundation: 1 ch: 1 dc in each of next 18 ch, 3 dc in next ch, sl st to join. Work 2 more rounds, working 3 dc in stitch at each end of sole as before. 4th round: 1 ch; (1 dc in each of next 19 sts, 3 dc in next st, 1 dc in each of 3 end sts, 3 dc in next st, 1 dc in next st) twice; sl st to join. Work 1 round dc on these 66 sts to complete sole and fasten off. 1st row: Rejoin yarn. 3 ch; miss 1 st; 1 tr in next st; (1 ch, miss 1 st, 1 tr in next st) 15 times, turn. 4th row: 2 ch, 1 tr in each ch and tr on previous row. 6th row: Without turning, work in crab stitch back across the row. Crab stitch is worked exactly as you do double crochet - but from right to left instead of left to right (assuming you are right handed and normally crochet from left to right). It seems very awkward but just force yourself to do it; push the hook through the stitch to the right of your needle, pull through a loop, then yoh and pull through both loops on hook. Foundation Row: 1 dc in 2nd ch from hook, 1 dc in each ch to end. 2nd row: work a row of dc, working 3 dc in centre stitch. 3rd row: work a row of dc, working 5 dc in centre stitch. Work 1 row crab stitch along shaped edge. 2nd and 3rd rows: 1 ch, 1 dc in each stitch to end. and as close as possible to the tip. 2 ch, miss 2 rows, 1 dc in next row. Work 1 row crab stitch along both sides. Sew Toe and Sandal Straps in place on sole, (see photo). Join Ankle Strap to top of Sandal Back; pass through buttonholes worked on each side of the 3 dc strap. Work buttonhole loop at end of Ankle Strap, and sew button to Sandal to correspond. Work a row of crab stitch round outer edge of Sole. Make a second sandal and reverse position of Ankle Strap and button. 1 ball cotton 3 ply - possible yardage: 219 yards (200 meters). Equivalent tension of 30sts x 40 rows to 4 inches (in stocking stitch on 2½mm needles). The pattern is given in one size. Remember these are English crochet instructions where dc is equivalent to US single crochet - see "Terminology" in the side bar. The original yarn was Phildar 100% cotton "Perlé 5" with a suggested yardage of 219 yards (200 meters). draw a loop through next stitch, draw a loop through both loops on hook. [American single]. pass yarn round hook, draw a loop through next stitch, draw a loop through first 2 loops on hook, then draw another loop through 2 remaining loops. pass yarn twice round hook, draw a loop through next stitch, draw a loop through first 2 loops on hook, draw a loop through next 2 loops, then another through last 2 loops. pass yarn three times round hook, draw a loop through next stitch, draw a loop through first 2 loops on hook, draw a loop through next 2 loops, another through next 2 loops, then another through last 2 loops. * not used in this pattern. Here is a You Tube item showing how to do crab stitch - a picture painting a thousand words and so on.